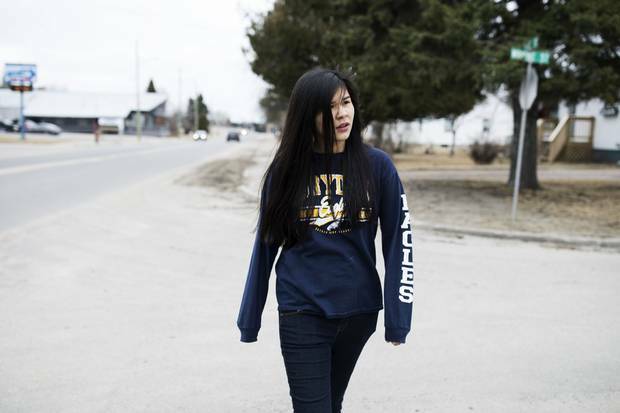 Marleah Atlookan, a 15-year-old student from Northern Ontario’s Eabametoong First Nation, studies at Dryden High School. Only about a third of Indigenous students in her school board graduate in four or five years, but Marleah has a secret weapon working in her favour: A graduation coach who’s helping to make sure she gets her diploma in June, 2019. Marleah Atlookan has a whisper of a voice, jet black hair that parts like drapes over her face, and a habit of hiding her hands in the cuffs of her long-sleeve shirt. The 15-year-old rarely makes eye contact with strangers, especially when exploring a memory she has never been able to fully explain to herself. She was only five years old, returning one evening to her home at Eabametoong First Nation, also known as Fort Hope, a remote community almost 400 kilometres north of Thunder Bay, when she saw a sight that still haunts her today. Her mother, Emily, was outside, her body hanging from a pipe overhead. Marleah struggled then, as she does now, a decade later, to understand why her mom would want to end her life. "That's all me and my brothers had, is my mother," she says, staring up at the ceiling and fidgeting with her fingers. "I had this anger that she didn't love me," she says, softly. "But I know she did. I knew she loved me." Her mother didn't die that day. She died 10 years later, on Jan. 1 of this year. Brain damaged from the suicide attempt and living in a care facility in Dryden, Ont., she needed assistance with eating – and choked on food that Marleah was feeding her. Months later, the teenager still blames herself for her mother's death: "What if I just didn't feed her?" she asks, her voice cracking as she nervously taps her foot and focuses her eyes on the floor. The trauma of the past 10 years has taken a devastating toll on Marleah, and not surprisingly, she has had her share of struggles in school. She skips classes, when she can get away with it, and on days she does attend, she's often preoccupied and troubled by anxiety. She wants desperately to finish high school, but the prospect sometimes seems daunting. Viewed through the cold lens of statistics, the odds are stacked against Marleah. Only about a third of Indigenous students at her school board in northwestern Ontario finish their studies in four or five years. But the shy teenager has a secret weapon: someone who cares whether she graduates or not. As she headed north to the family funeral in January, her mind full of memories of her mother's smile, Marleah received a simple four-word Facebook message. "Hey, how's it going?" it read. To anyone else, the greeting might have seemed unremarkable – the sort of dashed-off pleasantry that's not intended to convey much. To Marleah, it meant far more. It reminded her once again that the person who wrote it is determined to see her cross the stage at Dryden High School two years from now to accept a distinction that's sadly uncommon among her peers: a high school diploma. It'll be June 2019 by the time she gets it, but she is already on her way. At the end of Grade 10, she has an 87 per cent average. A truck drives down a lonely road in Dryden. The community is one of many in northern and northwestern Ontario where Indigenous people, moving to urban centres in hopes of better lives, grow the economies of otherwise struggling cities. A typical lunch hour at Dryden High School: Students drop in to spend time with graduation coach Kieran McMonagle. If they’re hungry, they can always help themselves to snacks. Sometimes, the students share so much raw pain, Kieran McMonagle needs to end her day with a session of calming meditation. She sits cross-legged on her bed, closes her eyes and drapes mala beads around her fingers. As she pulls each bead forward with her thumb, she recites a mantra: "My experiences make me wiser, stronger and more prepared." It can be difficult to forget the struggles of her students before she turns off the lights. Some nights, her mind buzzes with memories of rushing to the local emergency room to help teenagers recover from substance abuse, self-harm and suicide attempts; on other evenings, she thinks about the plight of students who are grappling with homelessness. The 27-year-old is not a trained teacher, but her classroom inside Dryden High School is always busy – 169 Indigenous students in Grades 9 to 11, one of whom is Marleah, rely on her to help them make it through the academic year. Her title is "graduation coach," a role that requires her to be equal parts counsellor, confidante, adviser and taskmaster. To students like Marleah, she's also like a mother. Her position – a new one – is unusual in the education system, but advocates in the school board argue it is vital in helping kids overcome a troubling barrier. Indigenous students in the Keewatin-Patricia District School Board graduate high school at less than half the rate of their non-Indigenous classmates. Some might take longer to complete school, while others struggle and drop out. The challenges are similar across the country, and should horrify Canadians. Those behind the program in Dryden suggest the efforts go beyond boosting students' literacy and numeracy scores – it is about providing psychological supports that can sometimes save lives. The benefits of earning a high-school diploma are clear: More education helps students lead healthier and more productive lives. One study, by a former federally funded organization, estimated high school dropouts cost Canada's social and criminal justice systems $1.3-billion a year. Low levels of schooling among First Nation children are correlated with poverty, crime and a reliance on government support for housing, a C.D. Howe Institute report found. In fact, the report stated, a high school diploma increases the probability of being employed by at least 25 percentage points, regardless of whether the student is First Nation, Metis or non-aboriginal. Kieran McMonagle distributes paper plates to students at lunch hour. Most of the students don’t bring lunches to school with them, so food is often supplied. Ms. McMonagle , who self-identifies as Metis, is determined to turn around the discouraging statistics. Her converted classroom sits along a heavily trafficked hallway of the high school. Students who drop by to see her spread out on couches, or around tables. The room projects a calm, quiet vibe. Boys huddle over online games at a row of computers lining the back wall. Posters in the shape of feathers line the walls and carry the seven Grandfather Teachings – or guiding principles – of Indigenous culture: Wisdom, humility, respect, honesty, truth, love and courage. Ms. McMonagle has put up posters of programs at the nearby Red River College – a way to motivate her students to a future beyond high school. She tracks the progress of every self-identified Indigenous student on spreadsheets. The ones with a green tag are doing well, and Ms. McMonagle helps them connect with opportunities that will enable them to build on their success. One such student is doing a summer program in health sciences at the University of Toronto. But green tags are rare: For the most part, the sheets are a sea of yellows, reds and stars – indications of students facing varying degrees of challenges. About 60 per cent of her kids need more than just academic help. The students with a yellow tag need some academic and social supports, while the red group is monitored closely. They are the ones who require interventions from agencies. The "starred" kids, the final group, have experienced such severe traumas that they are usually in treatment or in need of help. Kids can easily move from green to starred because of a traumatic experience, such as witnessing or even attempting suicide. Marleah has a yellow tag beside her name. "Some days, I say my job is keeping kids in school, in classes," Ms. McMonagle says. "Some days, I say my job is keeping students alive." A passionate advocate for her students, she conveys a warmth and openness that quickly makes visitors feel welcome. "I get very emotional because I'm so proud of them," she says, her eyes welling with tears. "With some of them, you sit there and you're like, 'Holy cow, you shouldn't have made it this far.'" With Ms. McMonagle’s help, Marleah’s attendance and grades have improved. Still, Ms. McMonagle is watchful and reaches out when she thinks she needs to. She met Marleah when the young girl was finishing elementary school. Ms. McMonagle receives a list of all self-identified Indigenous students in Grade 8 and brings the kids in once a month for an orientation – and to begin forging what she hopes will become a bond. She takes detailed notes on students' strengths and struggles. She attended Marleah's elementary school graduation that June, as she does for all her new students, and she invited her to the high school in August to take a summer course and earn a credit toward graduation. Ms. McMonagle can still remember how reserved Marleah was when she started high school in September, 2015. The quiet teenager preferred to wander the halls alone rather than sit in a room filled with other students, she says, recalling times when she would find her charge in the hallway and walk her to class, then wait outside the room until she sat down to learn. Marleah was particularly reluctant to go to math class – an issue Ms. McMonagle explored with her one day by asking a series of questions. Do you like the teacher, she asked. "Yes," Marleah responded. Is the work too hard? "No." Is it the kids? She fell silent. Are there too many kids? "Yes." Being around so many unfamiliar faces made Marleah anxious, Ms. McMonagle discovered. So she devised a plan with the math teacher: Marleah would stay in class for the lesson and then move to another room where she felt more comfortable to work on her assignments. Now, when Ms. McMonagle sees Marleah in the hallways, she simply asks her where she's supposed to be and the teenager walks to her classroom – by herself. She is still quiet, but she's showing clear signs of improvement. Her attendance has increased by 45 per cent compared to last year and her marks are rising. This year, she earned an impressive 72 per cent in math, up from 62 per cent in Grade 9. Her lowest mark was 65 per cent (in English), significantly higher than her lowest mark last year (52 per cent in geography). And her highest mark this year? A stunning 95 per cent, in communication technology. Still, Ms. McMonagle keeps a watchful eye, and reaches out when she thinks she needs to. When Marleah returned from Fort Hope after burying her mom, Ms. McMonagle was nervous about how the experience would affect her. Cautiously, she asked the teenager how she felt. Marleah told her she was coping, but Ms. McMonagle wasn't convinced. She checked in with Marleah's closest friend to see how the girl was faring. Then she sat down with Marleah and encouraged her to speak with a mental health and addiction counsellor. She still watches the girl closely, not wanting her to lose her way. With everyone she deals with, Ms. McMonagle works to earn trust through personal phone calls and visits. Many families lack faith in the government-funded education system – it was a government system, after all, that robbed them of their culture and identity through the now-notorious residential school system – but she has managed to get them to crack their door open to talk about how their children are doing. When the doors don't open, she seeks them out at community barbeques and pow wows. "It's kind of like being a parent – you're on all the time," she says. "We never give up on our students." A train rolls past Dryden’s pulp mill, a reminder of the once-thriving industry that dominated the city’s economy. Ms. Beyak is from Dryden. Many people in her hometown distance themselves from her statements, but tensions between white residents and Indigenous people continue to exist in northwestern Ontario. Five years ago, when the school board wanted to partner with Keewaytinook Okimakanak, a council of six First Nations in Northern Ontario, to convert an unused elementary school into a boarding facility for Indigenous kids, some neighbours opposed the plan. Some residents did not like the idea of a live-in program for kids from northern reserves moving into their quiet, tree-lined street. They collected signatures to oppose the rezoning of a school site to allow for accommodations, and showed up in large numbers at city council meetings, spilling into the corridors, according to the local newspaper. Chris Marchand, who grew up in Dryden and covered the protests for the Dryden Observer, says residents objected to the proposal mainly due to a fear of the unknown. "It all goes back to class and community standards," he says. "It probably has more to do with that than the actual racial issue. But those things are so closely tied together in this region." 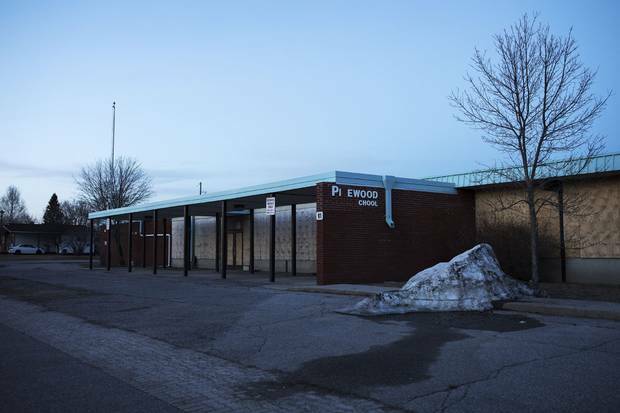 The former Pinewood school site in Dryden has been sitting vacant for years. 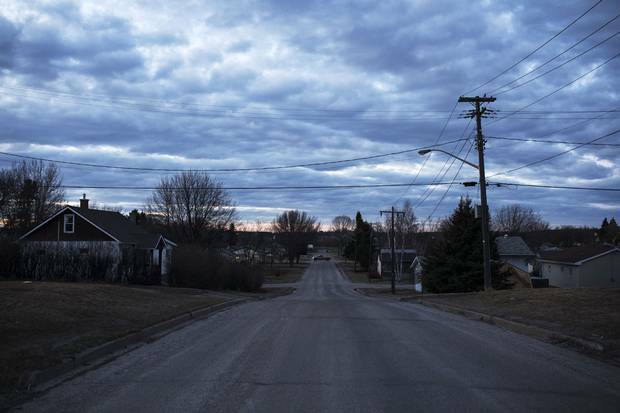 Dryden, population 7,749, is a microcosm of the dramatic shift happening across northern and northwestern Ontario, where Indigenous people are moving into urban centres, growing the populations of cities and towns that might otherwise be considered dying. On a recent Friday evening, the roar of pickup trucks punctuates the eerily quiet main streets where squat, two-storey storefronts have locked their doors early. The city's skyline falls under the shadow of the Domtar pulp mill. The plume of white smoke drifting from the mill into the crisp evening air can be seen from anywhere in town – a constant reminder of a once-thriving industry that has now lost much of its steam. The influx is shifting the demographics of the city in other ways, too: In Dryden, as in the rest of Canada, Indigenous people are having more children than the general population is, and as a result, the average age of residents is becoming younger. In 2013, the Indigenous population under the age of 19 represented 38.5 per cent of the total youth population in the Kenora-Dryden area. That number is expected to climb to 43 per cent by 2041, according to the Northern Policy Institute. The Keewatin-Patricia District School Board has seen the percentage of students identifying as Indigenous grow from 40 per cent in 2007-08 to 53 per cent this year. The influx of Indigenous people into urban centres has caused tensions in this part of the country, especially in places like Thunder Bay, where the strained relationship between city police and the aboriginal community has made recent headlines. A coroner's inquest that looked into the deaths of seven Indigenous youths between 2000 and 2011 concluded last year. All were originally from remote reserves and had moved to Thunder Bay to pursue a high school education, which they couldn't do on reserve. Damien Lee, an assistant professor in Indigenous studies at the University of Saskatchewan, and member of the Fort William First Nation, says that the racial tensions boil down to Indigenous people not being accepted off reserves. Indigenous bodies are not welcome in urban space, Prof. Lee says. "How are non-Indigenous people reconciling the fact that Indigeneity is taking up more space in a place that is supposedly not meant for them? One of the ways … is by saying, 'That [boarding] school doesn't belong here.'" 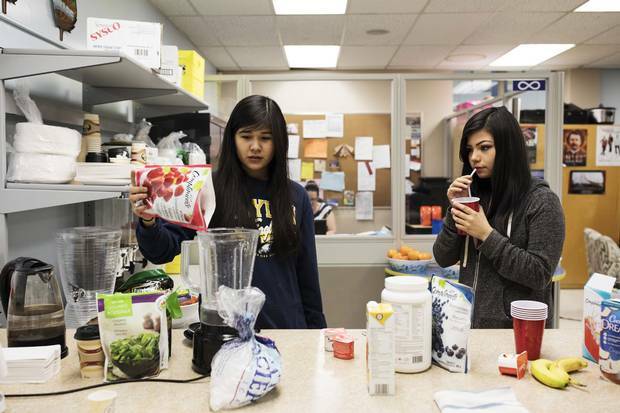 Marleah Atlookan pours frozen fruit into a blender as she makes a smoothie during a life-skills class. Marleah’s career goal is to be an executive chef at a restaurant. Home from school, Marleah looks at the television her father, James Trout, is watching. Mr. Trout, a residential school survivor, has tried to shield Marleah as much as possible, sharing little about his difficult journey to graduating high school. James Trout says he would have been "harming" his daughter's future if he had let her stay on the Eabametoong First Nation reserve. 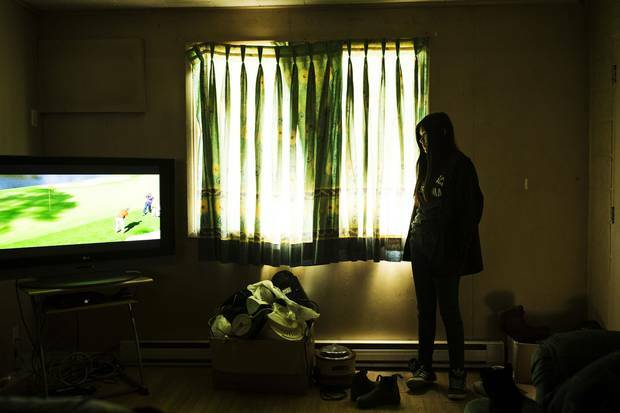 He moved to Dryden after Emily's attempted suicide and took Marleah and her older brother under his care, leaving his own community in Lac Seul, about 70 kilometres away. "I see all these young native youth that have no life goals or ambitions. So I have to move in order for my daughter to get an early start in education," he says, describing the federally funded schools on reserves as providing an education "two years behind" their provincially run counterparts in urban centres. 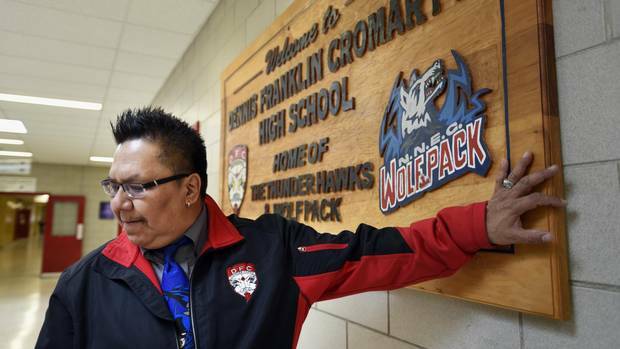 On-reserve schools often struggle to retain teachers. Several lack infrastructure and can't offer as many educational programs. Many First Nation communities don't have high schools at all, so teens have to leave their families and homes, many times alone, to attend provincial schools or schools operated by First Nation bands. Families who choose this option often send their children to board with families they don't know. Mr. Trout wanted a different scenario for his daughter. Marleah's father has a broad, welcoming smile. He says he once worked as a house counsellor at the First Nations-run boarding school near Sioux Lookout. A certificate of distinction hangs on one of the walls in his living room, honouring him for saving the life of a child. He says he found the boy hanging in the woods. 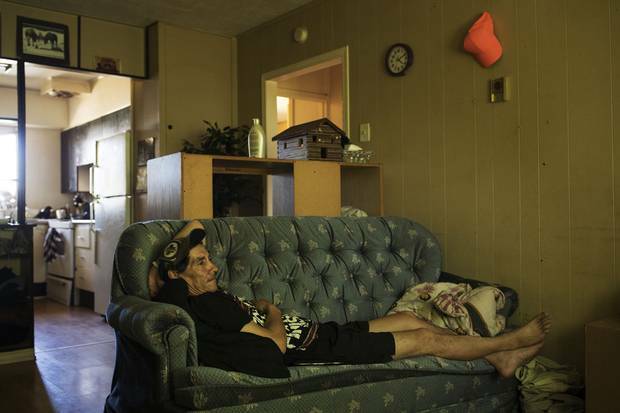 Marleah’s father, James Trout, watches television inside their two-bedroom home. Mr. Trout sleeps on the couch so Marleah and her brother can have their own rooms. Although he's a high school graduate himself, he describes the road to his diploma as devastating. A residential school survivor, he was pulled out of his reserve community in Lac Seul when he was five, and enrolled in a residential school near Sioux Lookout. He has shared little of this journey with his daughter, shielding her as much as he can and trying his best to provide a supportive environment. He moved to the apartment in Dryden where he lives with Marleah and her brother about eight years ago. The air in apartment No. 2 is musty and the walls are stained. The green curtains in the living room are tied with plastic bags, revealing a cracked window. Clothes are piled on shelves just outside the kitchen and overstuffed boxes are strewn across the floor. But Marleah and her brother each have bedrooms. Mr. Trout sleeps on the tattered green couch in the living room. He doesn't have much left of his past; his trailer on his reserve burned down many years ago, he says, although he managed to save a small pouch. In it are pictures of Marleah as a baby, asleep on a bed, safely swaddled, her head full of black hair. On the back of one, someone has printed her full name: Marleah Dawn Atlookan. She is four days old. Mr. Trout speaks proudly of his daughter. He wants her to graduate high school and attend a post-secondary institution. He describes Ms. McMonagle as a lifeline for his daughter, "guiding" Marleah through school and acting as a female role model. "She wants to be a chef. So that's what I'm hoping for," he says. "She's a strong girl." For her part, Marleah says she doesn't want to fail her father. She knows he wants her to graduate, and she keeps that in mind when she's struggling at school. "It becomes difficult sometimes, but I still do it," she says. "Sometimes I just want to give up … but I still continue." 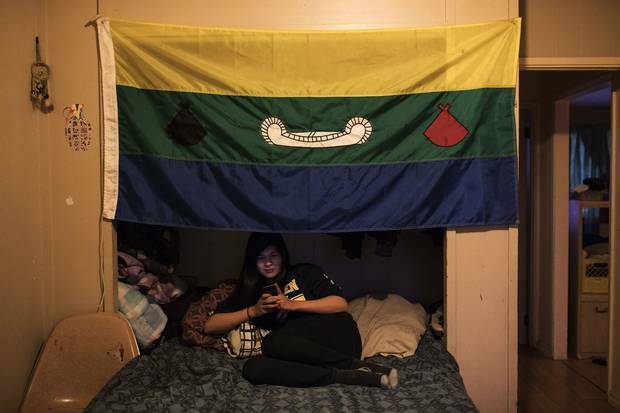 The flag of Marleah’s First Nation, Eabametoong, hangs over her bed. Marleah says that she spends most of her evenings on her phone inside her bedroom. Her best friend, Titanice, lives an hour away, so Marleah is often alone. In his 15 years as a school administrator, first as a principal, then as a superintendent and now as the education director for the Keewatin-Patricia District School Board, Sean Monteith has made the painful phone call more than 50 times – breaking the news that a child has died. He tries to reach a parent, usually the mom, if she is involved in the child's life. He expresses his sorrow. He's a parent, too. Almost every time, he says, the reason is suicide. It happens too frequently in this part of the world. "It is just a constant raw reminder of why this work is so important," Mr. Monteith says. "Graduation isn't just about crossing the stage and getting a diploma. It represents an interruption to many cycles that have hindered and prevented optimism." Mr. Monteith, 46, has lived in northwestern Ontario his entire life. He remembers his own graduation ceremony in 1989 from Beaver Brae Secondary School in Kenora, about an hour and a half west of Dryden. Many Indigenous students who started the Grade 9 year with him were not there at the local recreation centre five years later to receive their diplomas. When he became director of education four years ago, he decided to take on the problem. A no-nonsense man, he speaks passionately about how to change the course for hundreds of Indigenous children. Across the country, nine out of 10 non-Indigenous Canadians between the ages of 20 and 24 have a high school diploma, according to a C.D. Howe Institute report. That figure reflects Dryden High School's non-Indigenous graduation rate too. But the numbers are different for students who identify as Indigenous: Of the 46 Indigenous students who started Grade 9 at Dryden in 2012, only 18 received diplomas last spring – a 39 per cent graduation rate. Mr. Monteith promises the graduating classes that follow will look different. Before introducing the graduation coach program, the board had tried other strategies, including summer programs to help students earn credits and engage them in learning. Nothing worked. "You can run all the programs you want, you can get kids involved in youth drop-in centres. That doesn't give kids hope," Mr. Monteith says. "They've got to see a value in themselves. They've got to see an outcome." So when he heard about a graduation coach program that the Catholic school district in Edmonton was experimenting with, he was eager to try it. His district introduced the initiative three years ago at Dryden High School (it expanded the program in subsequent years in Kenora and Sioux Lookout; a fourth high school will introduce it this fall), paying for it with public funds earmarked for special programming for student success and some of the board's operational budget. The program represents a shift in thinking about how to help struggling students. For too long, education has focused on boosting academic marks. Kids were assumed to be emotionally resilient. The best way to move beyond trauma was to excel in school, continue to post-secondary education, and "break the cycle." Now, that thinking has changed. There's a growing understanding in education circles that trauma shapes the academic and social lives of children. Growing up in stressful environments affects their brain development, and the odds of having learning and behavioural problems are that much greater. Interventions can be simple. Positive change can come from having a caring adult, a coach like Ms. McMonagle, who can help foster resilience and optimism – characteristics that are increasingly seen as vital to help kids find academic success. Mr. Monteith and his colleagues were surprised at how quickly they saw changes when they first introduced the grad coach model: Kids started attending classes, earning their credits, volunteering around the school and starting to participate in clubs and sports. Fewer Indigenous students – just two per cent – were leaving after the first semester of Grade 9 at Dryden High School, compared to 16 per cent before Ms. McMonagle started. In Marleah's Grade 10 group, about 70 per cent of the 48 self-identified Indigenous students have their crucial 16 credits. Other school boards are taking notice. Lakehead Public Schools, a district nearby, adopted the model this year. "It's the best thing I've ever seen to date," Mr. Monteith said. "As time goes on, I'm starting to think this is the answer." The early signs show promises. But can it be sustained? Marleah, left, and her friend Titanice have both grappled with personal hardships to succeed in their studies at Dryden High School. Marleah has plans beyond high school. She wants to be an executive chef at a restaurant. Ms. McMonagle has shown her it's possible. She knew Marleah had an interest in cooking – the teenager had talked about making comfort food (spaghetti and casseroles) at home and said she wanted to learn techniques and recipes. 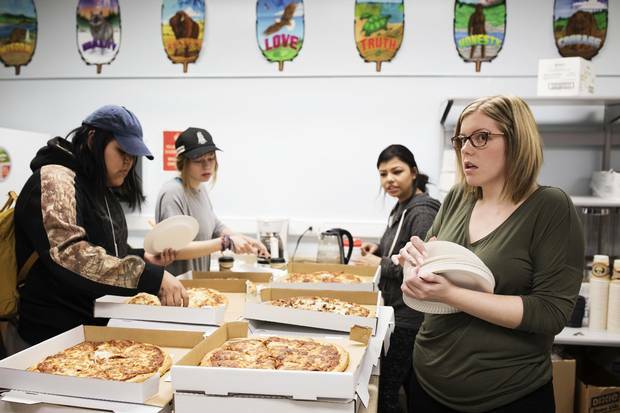 So when an opportunity arose for students to cater school board meetings, Ms. McMonagle approached Marleah and a few other Indigenous students. Marleah was excited. Ms. McMonagle warned her that if she didn't show up for classes, she couldn't cook. "That's fair," Marleah responded. So far, Marleah has stepped up: She draws up the grocery lists; finds the best deals; and puts together the monthly menus, featuring meals that have included pork loin with seasoned potatoes and asparagus, a rack of lamb, lasagnas with salad and Indian tacos. Ms. McMonagle keeps a watchful eye on Marleah and her team. "I like cooking," Marleah says, noting that when she's busy preparing a dish, all she thinks about is the task at hand. "You don't think about other things." Ms. McMonagle helped her get a job on the weekends and after school at a local restaurant in Dryden. The pair went shopping together for work clothes, outfitting Marleah with four pairs of black pants, a few black tops and comfortable black shoes. In May, she took Marleah and a group of other students on a tour of Confederation College in Thunder Bay. Marleah wandered about the culinary school in awe. Before she met Ms. McMonagle, she wouldn't have dreamed of attending post-secondary education. "Without her I'd probably be failing," Marleah says. Now, her hopes of attending college seem tantalizingly within reach. "I come to school every day because I want to prove to people that I could succeed," she says. "I don't like when people underestimate me." 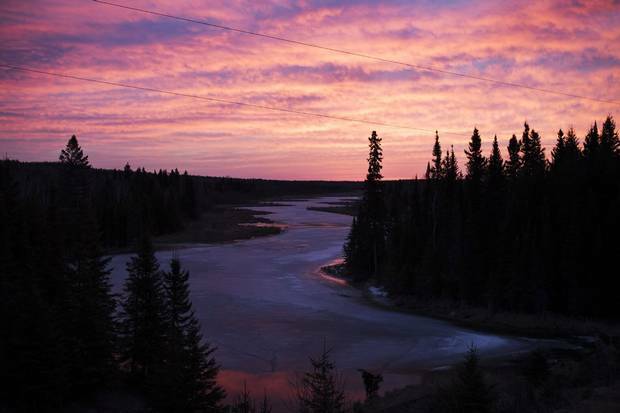 A colourful sunrise illuminates the river along Highway 17 between Thunder Bay and Dryden. Caroline Alphonso is an education reporter at The Globe and Mail. 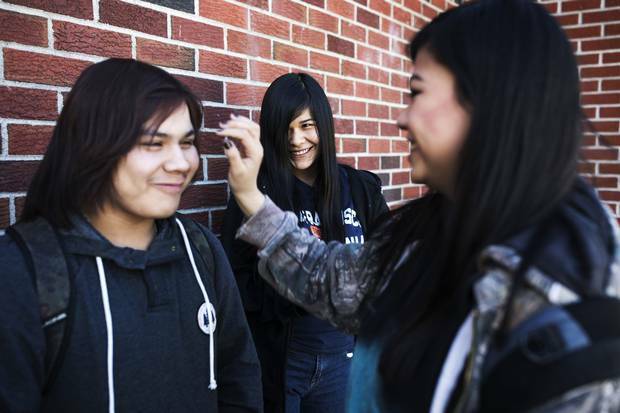 Breaking the cycle: Inside a high school that is reimagining indigenous education In 2015, The Globe’s Madeleine White met the students, principal and support workers who are determined to make Thunder Bay’s Dennis Franklin Cromarty High School a success. 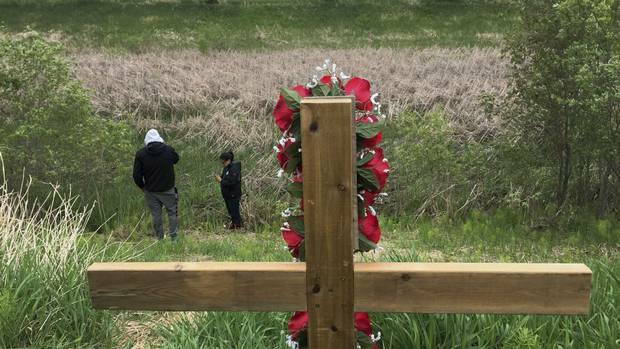 Thunder Bay’s Indigenous guardians volunteer to protect their community In a city where seven Indigenous high-school students have been found dead in the water since 2000, the Bear Clan Patrol is keeping watch for signs of trouble, Patrick White and Joe Friesen report. 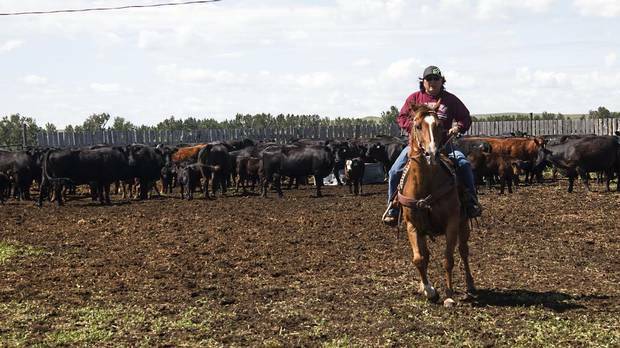 Fund aims to help Alberta’s Indigenous women start businesses Across the country, Indigenous people face barriers to accessing small business financing. Mark Rendell explains how a new fund aims to change that. 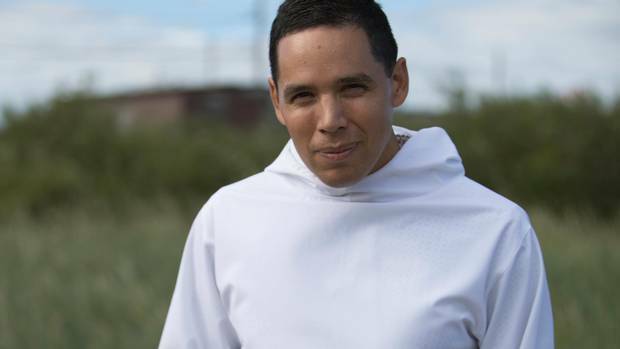 Natan Obed: Repatriating our written language is Inuit self-determination in action Inuit in Canada will continue to work in all ways possible toward equitable political, legislative, program and policy foundations to learn, speak and use our language.